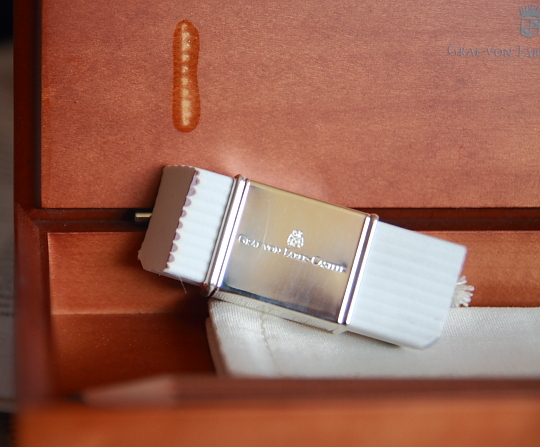 I keep a few Graf von Faber-Castell (GvFC) pencils, the ones with the silver-plated cap, in the wooden gift box that came with the GvFC Perfect Pencil. There’s something else I keep in this box: The GvFC eraser. You’d think they’d play well together, but unfortunately they don’t. When I opened the box this weekend, after not having used it for a few weeks, I saw that the eraser got brown where it touched the wood. No problem, I don’t mind – my Staedtler Mars Plastic got brown when I stored it in my Sonnenleder Lasse case. The Staedtler / Sonnenleder combination did however not have any negative effect on the Lasse case. Back to Graf von Faber-Castell: I don’t mind the eraser changing colour, but what I do mind is that the wooden box changed. The colour changed where the eraser touched the inside of the lid and around the area of discolouration is a gluey layer of something – very sticky when you touch it. Faber-Castell tries to use environmentally friendly production techniques, e.g. water-based varnish. I wonder whether that has something to do with this problem I encountered. This is actually the second problem I have with this wooden box.The first problem was that one of the corners was bend. I am not sure whether this was due to bad packaging, I guess it was more likely because the parcel delivery service were not careful. I was able to fix this corner issue more or less by bending the corner back and by painting the discoloured wood there with a brown Stabilo marker. I am not sure what to do about this new issue though. Use sandpaper to remove the sticky layer? …and never store the eraser in the box again? …or complain to Faber-Castell? For now I left the eraser in the wooden box, this time wrapped in paper. What a pity! I would tell Faber-Castell about it since the QA could be interested in that detail. Sorry to hear your GvFC box being damaged by eraser, what a shame. Though I thought most plastic erasers do that — they merge with many types of plastic and painted surfaces. I’m not sure on this, but rubber might be a type of amorphous solid (sometimes called glass), it behaves like an extremely slowly moving liquid which seep into other materials (usually materials of similar chemical composition I’m guessing). Judging by the picture in this post what happened isn’t discoloration, which usually implies photo- or sunbleaching, but is rather an extensive exchange of paint / pigments with eraser material. Simply put, the paint has transfered from box to eraser. It’s hard to tell from the picture, but maybe there’s a slight dent at the center of the discoloration, where paint was lift off by the eraser. I don’t have experience treating this, but maybe apply paint to the bald spots like you did to the bend corner, sand it, apply varnish then sand again? If you put the eraser back it will do the same thing again. I’d make a small cardboard box that fit the eraser and place the set in the wooden box. But an obvious drawback for this is, you have to take off the cardboard box to see the gorgeous imprinted eraser holder. Your eraser looks quite nice! How have you avoided tarnish? Gunther, I followed your advice and sent en email four days ago. Let’s see whether they will reply. Claire, Stephen described this eraser as a vinyl eraser. I am not sure whether vinyl erasers are better or worse, but I certainly didn’t expect it to behave like this. The ‘slowly moving liquid which seeps into other materials’ explanation sounds interesting and scary… I am not sure whether there is a dent. If there is one it is under the gooey layer which I haven’t removed yet… If GvFC doesn’t reply in a week or two I should probably follow your suggestion to fix the lid. Thanks. About the eraser, I was wondering whether it is sufficient to rest it on something else than wood and just make sure it doesn’t touch the lid? Stephen, I use silver polish cloths or a silver cleaning cream. They also work great on the small GvFC sharpeners as the leave the less exposed areas darker which gives a great overall look. Being better or worse depends on the polarity of its components and the surface it’s in contact with. Some speculations here: Water-based varnish would be polar, pvc has both polar and non-polar parts in the molecule so I’d expect pvc to be invasive; I don’t know what ‘vinyl’ eraser says about its composition, if it only has the vinyl group (i.e. the C=C double bond with hydrogen) then it’s non-polar and it’d be counterintuitive for me to know it also invades a polar surface. Pvc is made of vinyl chloride monomers, technically it’s also a vinyl polymer, even though people might exclude pvc when they say vinyl. If that’s the case, then we need to know what element/group in the monomer is attached to the vinyl group: fluorine and alcohol are equally bad, acetate, nitrile, methyl group or just hydrogen would make the polymer completely non-polar. Do they add other things (fillers etc) to the erasers during manufacturing? I don’t know what those material would do to the surface. I can’t imagine the eraser invade things it’s not in contact with, so if you put it away from the lid, the lid is safe. What about the pencils, are they painted as well? Wow its scary how a pencil accessory topic blooms into a chemistry lesson. Just goes to show what a great “lead in” the humble pencil can be…. and I do feel for you although my pockets don’t “extend” to GvFC products in any guise. Claire, I cannot say I understand what you wrote, but it certainly sounds very good. I assume vinyl might also be a very generic description of an eraser without really indicating its composition. After emailing Faber-Castell about the box I was asked to send the box and eraser in. Today, I received a parcel with a new box, together with my old box and the eraser sleeve. The rubber eraser in the sleeve has been replaced with a new eraser and they even sent a free pencil. Nice. Thats great Matthias…I hope FC changes the design to stop this happening again. Afterall thats what customer feedback should be about.